Once again, an April snowstorm interrupted schedules on Monday, April 22. 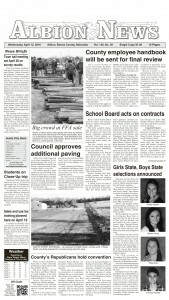 Local schools were dismissed early Monday afternoon, April 22, due to blizzard conditions throughout the area. 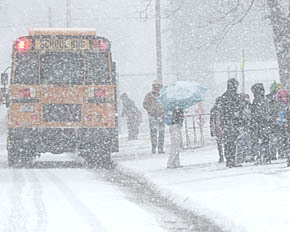 Above, a bus waits to load students at Boone Central Elementary during the driving snowstorm. The storm started as rain Monday morning and changed to snow by noon. It was all over by late afternoon with only a few inches of snow accumulated, but it forced cancellation of several meetings and activities early this week. Still, the moisture was welcomed.